Embryonic Stem Cells: Where do they come from and what can they do? Embryonic stem cells have captured the imagination of scientists and non-scientists alike. But what are they, where do they come from and why are researchers all over the world working hard to understand more about them? Human embryonic stem cells (ESCs) are pluripotent cells, meaning cells that can make any other cell in the body. They are made from cells found in very early human embryos, called blastocysts. 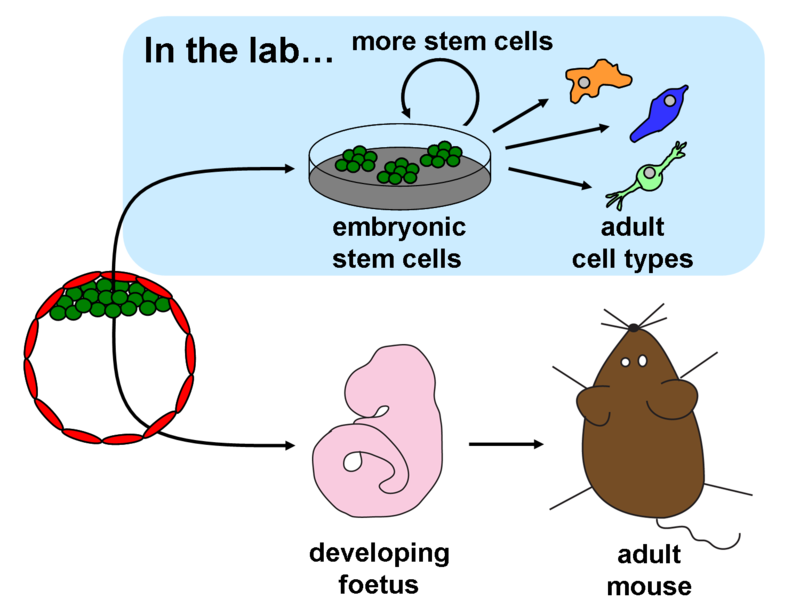 Many areas of science use mouse ESCs to study how blastocysts grow into adults and to study what signals direct stem cells to differentiate into specialised cells. An immense amount has been learned about embryonic development and disease from creating ‘chimera’ mice with genetically modified ESCs. These mice allow researchers to test how specific genes contribute to cellular functions and diseases. Researchers are learning how to create many different specialised cell types found in the body by exposing ESCs to different signalling molecules and growth conditions. Mouse ESCs are being used to learn about how the body develops, from early embryonic stages to the formation of complex organs. Researchers are learning how cells assemble into complex tissues, such as the layers of the brain, by attempting to grow primitive organs in the lab. Many studies are looking into how ESCs might be able to be used to treat numerous different diseases, from multiple sclerosis to blindness and diabetes. There are differences between how ESCs function for mice and humans. For moral and ethical reasons, researchers cannot use human ESCs as they do in experiments with mouse ESCs. This requires researchers to figure out how human ESCs work in more complex and indirect ways. Another challenging area is controlling exactly how ESCs differentiate into numerous specialised cell types. Finding ways to get large yields of specialised cells made from stem cells that are uniform and give reliable results is a major goal, but not one that is easy to achieve. An outer layer of cells, or trophectoderm, will form the placenta that supports the embryo as it grows inside the uterus. An inner clump of cells, called the inner cell mass, is a ball of 10–20 cells. These cells are undifferentiated, or unspecialized. They will multiply and differentiate extensively to make the many types of cells needed to form the entire animal. Some of the cells in the inner cell mass are pluripotent: they can make every type of cell in the body. If an inner cell mass is taken from a mouse blastocyst and given the right nutrients, the pluripotent cells can grow in the laboratory. The process of cell maturation and specialization that would normally take place in the embryo stops. Instead, the cells multiply to make more undifferentiated cells that resemble the cells of the inner cell mass. These laboratory-grown cells are called embryonic stem (ES) cells. Mouse ES cells can be put back into a mouse blastocyst and this blastocyst can then be returned to the uterus of a female mouse to develop into a foetus. The injected ES cells take part in the development of the foetus and the resulting pup is born with a mixture of cells, (a) from the host blastocyst and (b) cells that came from the injected ES cells. This new mouse with cells from two different origins is known as a chimera. Chimeras can pass on genes from embryonic stem cells to their offspring. Researchers can precisely alter the genes of ES cells in the lab, put the cells back into blastocysts, and produce new mice that contain the modified genes. Scientists use genetically altered mice made from ES cells to study genes involved in many human diseases. For example, they have made mice with mutations found in human cancers. These mice can be studied to learn more about how cancers grow and to test potential drugs. The immense value of this technique for science and medicine was recognized in 2007 when the Nobel Prize in Medicine was awarded to three scientists who pioneered the use of ES cells to create genetically modified mice. Scientists have also made stem cells from the inner cell masses of human embryos by employing a similar technique to that used to isolate mouse ES cells. You can learn more about the human embryos used in this research and where they come from in the factsheet, Embryonic stem cell research: an ethical dilemma. It is not allowed to inject human cells back into blastocysts, but these cells can be differentiated in the laboratory to make many different specialized cell types. By using human ES cells to produce specialized cells like nerve cells or heart cells in the lab, scientists can gain access to adult human cells without taking tissue from patients. They can then study these specialized adult cells in detail to see what goes wrong in certain diseases, or to study how the cells respond to potential new drugs. Human and Mouse ES cells have some different properties. Scientists are trying to understand why this is and whether human cells can be obtained with the same properties as the mouse ES cells. Researchers are also working to expand and perfect methods for making particular adult cell types from ES cells in the lab. Controlling exactly how ES cells differentiate is still a major challenge. Even so, some scientists are already investigating whether ES cells can be used to make adult cells that could be transplanted into patients to help heal injured or diseased tissue. EuroStemCell film, "A Stem Cell Story"
This factsheet was created by Kate Blair and reviewed by Jenny Nichols and Austin Smith. 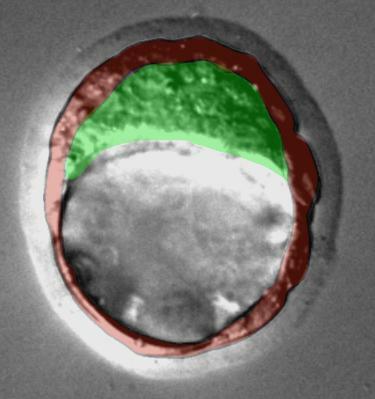 Human blastocyst image (lead image) by Mila Roode. Mouse blastocyst photograph by Maria Elena Torres Padilla. Chimeric mouse photograph by Jenny Nichols. Neuron photograph by Oliver Bruestle. All other images and diagrams by Kate Blair. 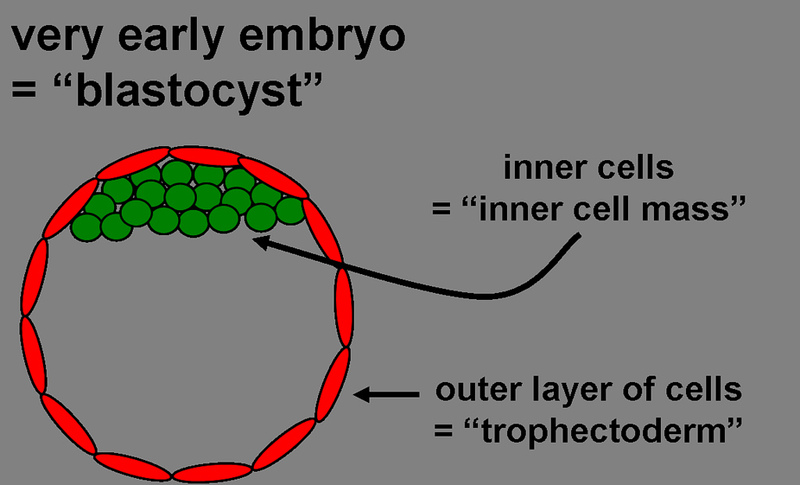 Embryonic stem cells are derived from very early embryos called blastocysts. The diameter of a human blastocyst is roughly four times that of a human hair. The offspring have a gene for black hair from the ES cells used to make their father. Neurons (nerve cells) made in the lab from human embryonic stem cells.